A project for Adam's english class..he asked me to buy him a green manila card and write his name at the back.. When I get home from work, excitedly I asked what did he do with the manila card? 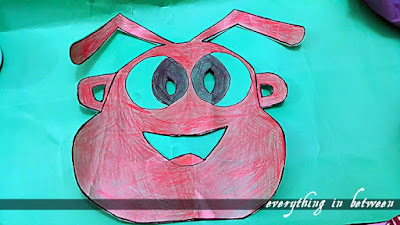 He said his english teacher asked him to draw an ant face.. But he said since he don't know how to draw, he's expecting me to draw for him..
Well, this is me drawing for my boy's english to make an ant.. the name in anne.. so Anne the ant..How do you guys rate my drawing?